There’s a ton of buzz around bodyweight exercises these days, but for someone who’s just starting out with them it can be hard to figure out where to begin. I know when I first started doing bodyweight exercises, I would try to do exercises which were way to difficult for me since I hadn’t built up enough strength yet. So there’s a couple things that are important to know before you start out with a bodyweight workout. It’s great that you’re looking into bodyweight exercises because there a ton of benefits to them. Bodyweight exercises have been proven to be awesome exercises to increase both muscle mass and strength for people who are just starting to build muscle (1). This is because doing some simple bodyweight exercises can help to begin to work your muscles in a relatively safe manner. Sometimes people lift with too much weight when using barbells or dumbbells. That’s a really common cause of injuries in the gym. But you’re much less likely to injure yourself doing bodyweight exercises because you can only go as heavy as your own weight. If you think about it, you’re much less likely to get hurt doing a push-up (2) or bodyweight squat compared with bench presses or squats with a dumbbell. Another huge benefit is that bodyweight exercises give you a great way to add variety to your workout routine. We all know that doing the same routine can lead to plateaus. If you change things up every so often, you’ll see way better results. You could also throw in a bodyweight exercises in with your regular weights routine. Now that you know the main benefits, what’s stopping you from doing bodyweight exercises? Well, there could be a few things that make bodyweight exercises really difficult for people who are just beginning to work out. The main one is that a lot of people who are just starting to exercise can’t lift their entire bodyweight. Exercises like pull ups are actually really hard to do when you first start off. Push-ups can be a huge challenge too. So how do you get around that? The best thing to do is work on some bodyweight exercises where you’re actually just using part of your bodyweight. We’ll talk about 5 of those exercises later. But generally, if you can just use a portion of your bodyweight, you’ll be able to get the benefits of bodyweight exercises without having to lift your whole weight. Another difficulty for beginners is that having the right form for bodyweight exercises can be tricky. It’s actually a lot trickier than you might think. Most people figure that they know how to do a push-up, but if you want to do it with the right form there are a few key things you need to watch out for. For sure at first it’s tempting to use poor form so that you can squeeze out a few more reps, but it’s not worth it. It’s better to do as many reps as you can with perfect form. That way you’ll get way more out of your workout routine. Push-Ups are an awesome exercise to help develop your chest and shoulder muscles. They’re one of the most common bodyweight exercises in the world because they’re so effective at building muscle. But for beginners, it can be hard to do a few push-ups. Doing even one push-up can be a challenge. A lot of people like to do knee push-ups, which are a modified push-up in which you put your knees on the floor. This does help to reduce the body weight that you need to lift, but it doesn’t work your core as much as a push-up does. That’s why I’d recommend going with an incline push-up. These push-ups are great for targeting your lower chest muscles and they’re generally much easier than a regular push-up. They target your lower chest because of the position of your arms, which is similar to a decline bench press. To do the exercise, put your hands on to a workout bench a little more than shoulder width apart. Put your legs out and support your body weight on your forefoot. You can keep your feet together or a bit apart, whichever is easier. Try to keep your body in a straight line from your toes to your shoulders. Lower your body weight by bending your elbows. But, don’t flare out your elbows. They should be mostly tucked into your body. Bring your body down until your chest lightly touches the bench. Then bring your body back up to the starting position. I absolutely love pull-ups as an exercise to develop the back muscles. They are by far one of the best exercises you can do for your back. You’re going to see amazing results if you do that exercise consistently. The problem is, it’s so hard to do a pull-up. Plus, it takes so long to develop the strength to do even just one rep.
Luckily, you can do a bunch of different bodyweight back exercises to build up the back muscles needed to do pull-ups. Sliding floor pull-ups are great because they work a lot of the same muscles as a regular pull-up, but are much easier to do for beginners. Also, you can do that at home and you don’t even need a pull-up bar. For sliding floor pull-ups, start by lying down on the floor on your stomach. Your legs should be out and slightly bent at the knee. Keep your feet off the floor. Raise your hands above your head while you keep your arms straight. Pretend that your reaching for an invisible bar on the floor. Then, with your palms on the floor, pull yourself forward by bending your arms in the same way you would with a pull-up. The top of the exercise is when your arms are bent at 30 degrees. You’ll be sliding along the floor on your stomach so that will provide a bit of resistance. You can increase the resistance by putting your feet on the floor. Dips are an amazing exercise for your triceps, chest, and a bit of shoulders too. These are one of my favorite bodyweight exercises because you can really see results fast by doing these. However, doing a full bodyweight dip is a really hard exercise. It takes a ton of strength and a lot of stability as well. Before you have developed that strength and stabilizer muscles, try bench dips. Bench dips will help to strengthen your triceps, which are huge muscles in your arms. Having larger biceps are going to make your arms look much bigger. They’re way more important than having bigger biceps. To do bench dips, put your hands on a bench behind you, about shoulder width apart. Stick your legs straight out with a little bit of a bend at your waist. Then, lower your body by bending your elbows. Important: remember to keep your elbows in, not flared out to the side. Remember what I said before about good form? You need it if you want to target your triceps. Bring your body down until your arms are bent about 90 degrees. Then bring yourself back up using your triceps. By far one of the best exercises for your legs are squats. Squats help to work your glutes, quads, and hamstrings. They also are great for improving your bone and tendon strength as well as your back and hip stability (3). The trouble is, doing squats with a barbell can be a really tough exercise, even with smaller barbell plates on the bar. Also, you want to make sure that your form is exactly correct, so it’s best to start with bodyweight squats before you move on to the barbell. This is an exercise where a lot of people just try to pack on as much weight as possible, but that’s definitely not what you want to do. You want to avoid injury and work the quads, hamstrings, and glutes to the max with proper form with your squats. To start the exercise you want to begin by standing up with your feet around shoulder-width apart. Some people choose to cross their arms in front of them or put them behind their heads. Either way works well. Squat down by bending your knees while keeping your hips back. Make sure that your lower back stays straight and your shoulders slightly back during this part. Try to go down as low as you can, and then come back up by straightening your legs. So those are some exercises for your major muscles groups; how about your core? You can blast your abs and core by doing some planks. Planks are awesome to work your abs as well as your lower back and obliques. This is one exercise which beginners are usually able to do without too many modifications. You just want to try to hold yourself up in the plank position for as long as you can. But if you’re finding that it’s too difficult and you’re not getting much out of it, you can do a forearm plank where you rest on your forearms rather than holding yourself up with your hands. For planks, you want to start in a similar position as a push-up. You should put your weight on your toes and hands (or forearms, if you’re doing forearm planks). Keep your body in a straight line, from toes to shoulders. Your glutes might be slightly raised up; try to avoid sagging your hips. Your hands should be about shoulder-width apart of a little bit wider. Try to focus on contracting or flexing your ab muscles as you hold that position. Hold the position for as long as you can. As you can see, there are some great bodyweight exercises that you can do, even if you are a beginner and just starting out in your workout routine. These bodyweight exercise are some of the safest exercises that you can do which will really stimulate muscle growth and help you lose fat. Start off by making some of these modifications, and soon enough you’ll be ready to move on to some more advanced bodyweight exercises. Effects of Body-weight Squat Training on Muscular Size, Strength and Balance Ability in Physically Frail Older Adults. International Journal of Sport and Health Science. Relationship of Push-ups and Absolute Muscular Endurance to Bench Press Strength. Journal of Strength and Conditioning Research. A three-dimensional biomechanical analysis of the squat during varying stance widths. Medicine and Science in Sports and Exercise. 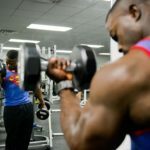 Can We Get Strong Without Going To The Gym?